The nbname auxiliary module scans a range of hosts and determines their hostnames via NetBIOS. To configure the module, we set the RHOSTS and THREADS values then let it run. 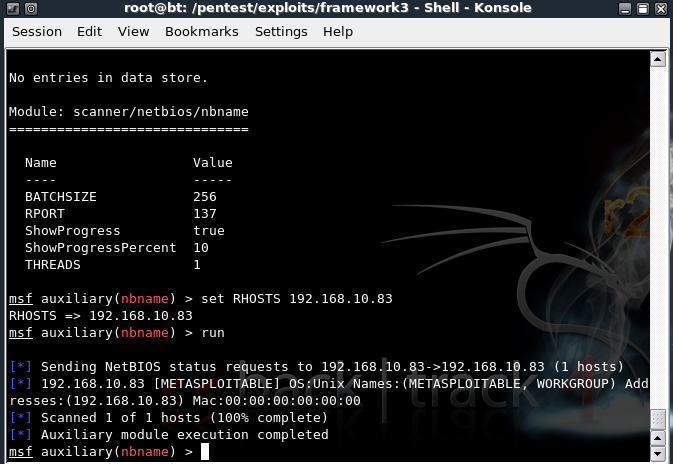 Note: The nbname_probe module is no longer in the Metasploit framework. The nbname_probe auxiliary module uses sequential NetBIOS probes to determine the NetBIOS names of the remote targets. The only configuration we need for this module is to set our RHOSTS and THREADS values and let it run against our remote targets.